Musicians getting together to help charity is an idea I can always get behind. I said as much when I reviewed a Big Footprint Records split earlier in the year, and the proceeds from that split went to The Boys And Girls Club of America. This time round, Soft Speak Records have compiled a 6 way split featuring Old Gray, Modern Baseball, Dikembe, The Hotel Year, Pentimento and Empire! Empire! (I Was A Lonely Estate), the earnings from which will go the Cystic Fibrosis Foundation. With events like this the music really isn’t as important as the cause, but it does help when the songs the split contains are as good as these. It’s very rare for any of the bands on the split to release bad songs, so it shouldn’t come as a surprise that there aren’t any. Modern Baseball and The Hotel Year submit new songs which will have a lot of people talking, and rightly so, because they’re both excellent. ‘Voting Early’ is trademark Modern Baseball, being a laid back yet quirky and charming number about politics and parties, whilst the split contains one of The Hotel Year’s best songs to date in the form of ‘Settle The Scar’, a reflective and cagey track with an explosive chorus that shows the band continue to improve. These two songs are the ones people will remember most after finishing the split, and for good reason because they are two of the best, but the other four tracks are also of a very high quality. 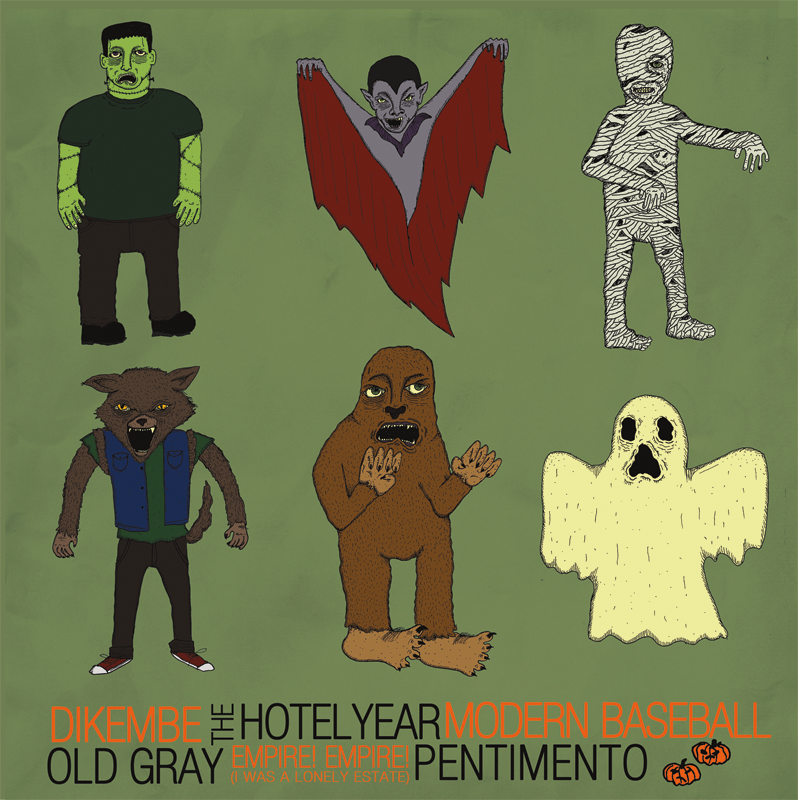 From the current play count on the POZ stream Old Gray, Dikembe and Pentimento are being overlooked even though their songs are also noteworthy. Old Gray, surprisingly, contribute with an entirely instrumental track which sees them excel without vocals. A creeping bass intro slowly unfolds as layers are added, and the final minute of the track is probably the best the split has to offer, being dynamic and exhilarating. The acoustic version of Dikembe’s ‘I Watch A Lot Of Jackie Chan Movies’ from last years ‘Broad Shoulders’ is soid enough, yet fairly forgettable, whilst Pentimento’s ‘It Happens To The Best Of Us’ rounds off an excellent split with the most rock orientated song. My favourite track of the split was Empire! Empire!’s, mainly because it’s exactly what you’d expect of Keith Latinen, a delicate track that floats along on basic guitar melody. It’s another hauntingly beautiful song to add to the Michigan bands discography that fans will love. The split is streaming in its entrity over on the Property Of Zack website which you can find here, In terms of purchasing it, you can find details on the Soft Speak Records storenvy site here, although I believe it might be sold out. I’d recommend you click at least one of the above links, becuase you’d be missing out if you didn’t.